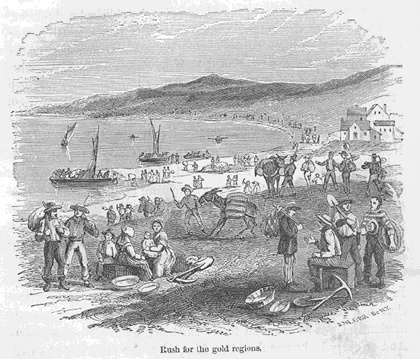 Early gold seekers in San Francisco; looking south towards Rincon Point across Yerba Buena Cove. Early in the spring of this year (1848), occasional intelligence had been received of the finding of gold in large quantities among the foot hills of the Sierra Nevada, the particulars of which discovery we have already given. Small parcels of the precious metal had also been forwarded to San Francisco, while visitors from the mines, and some actual diggers arrived to tell the wonders of the region and the golden gains of those engaged in exploring and working it. In consequence of such representations, the inhabitants began gradually, in bands and singly, to desert their previous occupations, and betake themselves to the American River and other auriferous parts of the great Sacramento valley. Labor, from the deficiency of hands, rose rapidly in value, and soon all business and work, except the most urgent, was forced to be stopped. Seamen deserted from their ships in the bay and soldiers from the barracks. Over all the country the excitement was the same. Neither threats, punishment nor money could keep men to their most solemn engagements. Gold was the irresistible magnet that drew human souls to the place where it lay, rudely snapping asunder the feebler ties of affection and duty. Avarice and the overweening desire to be suddenly rich, from whence sprang the hope and moral certainty of being so, grew into a disease, and the infection spread on all sides, and led to a general migration of every class of the community to the golden quarters. The daily laborer, who had worked for the good and at the command of another, for one or two dollars a day, could not be restrained from flying to the happy spot where he could earn six or ten times the amount, and might possibly gain a hundred or even a thousand times the sum in one lucky day; chance. Then the life, at worst, promised to be one of continual adventure and excitement, and the miner was his own master. While this was the case with the common laborer, his employer, wanting his services, suddenly found his occupation at an end; while shopkeepers and the like, dependent on both, discovered themselves in the same predicament. The glowing tales of the successful miners all the while reached their ears, and threw their own steady and large gains comparatively in the shade. They therefore could do no better, in a pecuniary sense even, for themselves, than to hasten after their old servants, and share in their new labor and its extraordinary gains, or pack up their former business stock, and travelling with it to the mines, open their new stores and shops and stalls, and dispose of their old articles to the fortunate diggers, at a rise of five hundred or a thousand per cent. In the month of May it was computed that, at least one hundred and fifty people had left San Francisco, and every day since was adding to their number. Some were occasionally returning from the auriferous quarter; but they had little time to stop and expatiate upon what they had seen. They had hastily come back, as they had hastily gone away at first, leaving their households and businesses to waste and ruin, now to fasten more properly their houses, and remove goods, family and all, at once to the gold region. Their hurried movements, more even than the words they uttered, excited the curiosity and then the eager desire of others to accompany them. And so it was. Day after day the bay was covered with launches filled with the inhabitants and their goods, hastening up the Sacramento. This state of matters soon came to a head; and master and man alike hurried to the place, leaving San Francisco, like a place where the plague reigns, forsaken by its old inhabitants, a melancholy solitude. On the 29th of May the Californian published a fly-sheet, apologizing for the future non-issue of the paper, until better days came, when they might expect to retain their servants for some amount of remuneration which at present was impossible, as all, from the "subs" to the "devil," had indignantly rejected every offer, and gone off to the diggings. "The whole country," said the last editorial of the paper, "from San Francisco to Los Angeles, and from the sea shore to the base of the Sierra Nevada, resounds with the sordid cry of Gold! GOLD!! GOLD!! !--while the field is left half planted, the house half built, and every thing neglected but the manufacture of shovels and pick-axes, and the means of transportation to the spot where one man obtained one hundred and twenty-eight dollars' worth of the real stuff in one day's washing, and the average for all concerned is twenty dollars per diem! " While labor was so well paid at this period, in San Francisco, it is a melancholy fact that there was much destitution, sickness, and even death by want and exposure in the place. Many of the immigrants had landed in a sickly and emaciated state, ill of scurvy and other diseases which their long voyage and hardships had produced ; and such people could not work. Others had miscalculated their own powers and inclinations, and the nature of the country they had come to, and were either ashamed or unable to perform honest labor; while perhaps they were too timid or upright to speculate in the variety of strange and often cunning ways by which other adventurers made a living and fortune. Disappointed diggers, returning from the mines with broken constitutions, swelled the destitute population. They probably lived in miserable habitations, sleeping often upon the bare earth. Around them were bustle and lucrative pursuits, while they alone seemed neglected. Then they lost heart, pined, took sick and died, cursing the country and its gold, and the foolish fancies that had led them to it. Many committed suicide in the utter prostration of physical strength, in feebleness or disease of mind and absolute despair. Public meetings were held to consider the destitute situation of the poor (strange word for such a country! yet San Francisco had its full share of the class), and large sums were raised for their support. The Orders of Free Masons and Odd-Fellows, nobly did their part in the charitable work, and were the principal means by which now, and at a later period, hundreds of sneering beings were saved from a miserable end, or their remains decently interred after death.